1977 - 1980 Studied social work in Bremen, Germany. 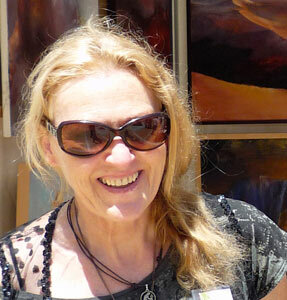 Member of the artist group „Gertrudenhof“ in Bremen, Germany. 1980 - 1983 Free lanced artist in Cipiére, Côte d´azur, France. 1983 - 1991 Scenery builder in Theatre Fey, Lübeck, Germany. since 1995 Free lanced artist in Cómpeta, Spain. Art and Therapie with delinquent teenagers. Monitor for art courses. profoundly and create inner images. I´m attracted by wide and inhospitable landscapes - like deserts - in whose apparent emptiness and solitude, every single sign of life becomes of immense importance. And I´m also attracted by inner deserts both in myself and mankind in general - the way everything find its way and breaks through overlaid layers. The desert as a symbol for the great power of nature and of life itself is absolutely vital. So, my paintings are always more a reflection of the emotional mood of my impressions than reality. Because there are no photographs or other records of these impressions, therefore I must paint and preserve them: make them visible. Specific themes do appear over the years again and again but not necessarily in a related time sequence.